The Dutch Fyra trains are marked return to sender. The replacements of the Dutch and Belgian Sea King helicopters are corroding. In 2014 the Antwerp “boerentoren” (farmers’ tower) was equipped with a cathodic protection system as the steel support structure was showing signs of corrosion. In 2011, lighting poles along the Belgian part of the E19 highway broke because corrosion had done damage at the base of their masts. And what will the sea water do to the Fukushima nuclear plant? The consequences of corrosion are dire. The expenses caused by corrosion add up to a total of just about 3.1% of the gross national product per year. Globally this constitutes around and about a dizzying 1.8 trillion euros. Apparently, corrosion is tough to control? It’s true that corrosion is a complex degradation process. Whether it occurs or not depends on a delicate electrochemical balance between the metals and the environment in which they are used. For example, a certain type of metal will behave differently when planted in the soil, compared to being used in fresh water, and differently again when used in sea water. The amount of rainfall and changes to the climate also make a difference. Layers of paint, galvanization, water treatment or the cathodic protection of the Antwerp boerentoren are merely examples of how technology can be adopted to prevent corrosion. But will the use of such technology suffice? Sadly, the answer is no. No matter how well these technologies were developed, nature always reigns supreme. Corrosion occurs because we’re only able to use most metals after we have used metallurgy on them, thus modifying their natural, stable state. Through the process of corrosion, the metal tries to transform itself back into its natural state (read hereafter more on 'ore stabity'). A world without corrosion can therefore never exist. This also means that we need to do more than simply using techniques for preventing corrosion. A proper selection of materials and a proper design, correctly executing the installation, regular inspection, monitoring and proper maintenance are the keys to corrosion-free industrial installations, vehicles, buildings, home appliances, etc. Bottom corrosion in an aluminium tube. In order to prevent all that corrosion damage, we should put the phenomenon in the spotlight, through both training and practice. The education system should inform everyone about corrosion, its causes, and how to prevent it. And not just the academic engineering programs either. Even in grade school and high school teachers should pay more attention to applied science, instead of simply focusing on exact science like math, physics and chemistry. Preventing corrosion is a prime example of the importance of applied science. Corrosion inside an industrial incinerator. Metals are derived from ore. Only a few metals are present in ore in their free state; the most well-known example of this is the precious metal called gold. Most metals are contained in their ore in a chemically bound state; they are tied to oxygen, hydroxide or sulphate ions. If the metal is chemically bound within its ore, then that’s the natural, stable state of that metal. 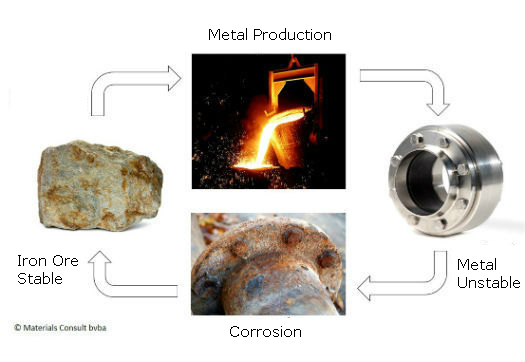 If we want to create steel, for example, we start with the iron oxides and/or iron hydroxides found in iron ore. Using a blast furnace or an electric furnace, we separate the iron from the oxides or hydroxides, which leaves us with iron as a free metal, which we can then use to create cast iron or steel. But the iron within the steel wants to return to its stable state and will therefore try to oxidize back or bind itself to hydroxide ions; the most common type of rust is iron hydroxide. Dr. ir. F.J.H. 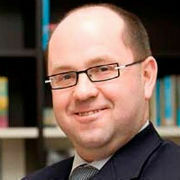 Vos, Founder and General Manager Materials Consult bvba and part-time visiting professor at University of Leuven (KU Leuven) in Belgium. G. Schmitt, Global Needs for Knowledge Dissemination, Research, and Development in Materials Deterioration and Corrosion Control, The World Corrosion Organisation, May 2009.